North Ambergris Caye has nice natural beauty, the rest of the island has little to offer. There are no real beaches outside the north, the entire east coast used to have beaches, now its dock city and golf cart hwy. You can head to the municipal airport in Belize City and book a flight which will take about 20 minutes with a stop on Caye Caulker with Tropic Air or Maya Island Air. You can also fly to Ambergris from the Phillip Goldson International Airport. There is a modest airfield near the center of the island situated right in San Pedro town. There is also air service from Corozal, Belmopan and Caye Caulker, Belize. The flight typically costs $135 USD return depending on who books the flight for you. San Pedro Belize Express  has departures, 14 first class boats and first class service to get you to and from Ambergris Caye. From Mexico and the Yucatan Peninsula Chetumal, Quintana Roo The connecting hub from Mexico to Belize is Chetumal, Quintana Roo. From Chetumal, take the San Pedro Belize Express water taxi from Muelle Fiscal (Municipal Pier). The boat leaves Chetumal enroute to Ambergris Caye every day at 3:00PM and ticket cost is $60 US, one way. From Belize City San Pedro Belize Express has 10 daily runs to Ambergris Caye from Belize City. Tickets are One Way $20 US / $40 BZ	Round Trip $35 US / $70 BZ. From Caye Caulker San Pedro Belize Express has daily runs to Ambergris Caye from Caye Calker. Departure times are 7AM (Connection to Chetumal), 9:45AM, 11:45PM, 12:45AM, 1:45PM, 3:45PM, 4:45PM, 6:15PM. Tickets are One Way $10 US / $20 BZ	Round Trip $17.50 US / $35 BZ. From Corozal Town Thunderbolt Water Taxi leaved Corozal Town at 7:00AM en route to San Pedro daily. It returns from San Pedro to Corozal Town at 3:00PM daily. US$22.50/BZ$45. each way per person. From San Ignacio Traveling from San Ignacio Town or other main land area, you will first need to take a Shuttle from San Ignacio to Belize City to a water taxi of your choice. Travel time is approximately 2 hours and rates start from $45 US per person. Its is highly recommend as use be many travelers transferring to either destination. There are three main north-south streets, and several that link them, running east-west. Barrier Reef Drive is closest to the two- and three-story apartment buildings that face onto the beaches. Only some of the roads are paved with cobblestones, and in the rainy season, many can fall into poor condition from traffic and rain erosion, and provide numerous potholes which are sufficient to slow the bicycle and golf cart traffic. There relatively few automobiles licensed on the island, and they are not needed because you can get to most places walking, by bike, golf cart, or water taxi. Most people get around Ambergris Caye by simply walking. There's a great deal of quality hotels in town, and many resorts on the island are less than a mile from the town of San Pedro, the only urbanized area on the island. Many travelers enjoy renting golf carts, which are the dominant form of transportation, next to bicycles. Others ride bikes or take water- or auto-taxis on the island. Wherever you are staying, you will be able to book tours that go all over Belize and even into Guatemala. Ambergris Caye is a great place to relax, and you can see a lot of what Belize has to offer with the trips that you can book wherever you are staying. The beaches are coral sand beaches and you may need watershoes or sport sandals. The island lacks any wide sandy traditional beaches in and around the town of San Pedro. The town itself can be a bit overcrowded, if looking for quieter more relaxing setting you'll need to hire a boat up to the north part of Ambergris caye. There are many piers (every 100 meters or so) where a tourist can rent a boat for diving, deep-sea fishing, or sailboating to other islands. If you're going to be in town for a couple of days be sure to snorkel or dive the spectacular Mesoamerican Barrier Reef, the longest in the Western hemisphere. Several marine reserves are close by. Hol Chan Marine Reserve, 4 miles (6.4 km) south of San Pedro, Ambergris Caye, tel: 226-2247 (E-Mail: [email protected]), . Has been protected for longer than the local reef, and so it usually has more mature marine life (i.e. bigger fish) as well as more people, though it's never terribly crowded. Bacalar Chico Reserve on the border with Mexico. Do not miss the Coral Gardens in front of Caye Caulker, Shark Ray Alley, or a fishing expedition to Mexico Rocks. The 'chicken drop' at Wahoo's Lounge where patrons pay $1 per square of a 10 x 10 floor. A rooster is then released and if he poops on your square number you win the $100 towards your bar tab. On weekends, there are very entertaining pick up soccer matches at the small stadium near the airport. If you visit the island during early July, take the water taxi to nearby Caye Caulker for the annual Lobsterfest. Great spiny lobster and coconut rice! Drink rum on the beach! There are many tour companies in San Pedro, Ambergris Caye. Many of these conduct day trips, leaving early in the morning and returning the same afternoon. Note that not all tours are available on any given day. Most tour companies require a certain minimum number of registrations before they run. Checking in the night before for which tours are available the next day is often the best option. Most hotels on Ambergris Caye will also book tours for you, with their preferred tour company. The more popular tours, such as Shark Ray Alley, Scuba Diving, and Sunset Sailing, run daily, so you need only provide a day's notice. Snorkeling Tours: Snorkeling in San Pedro can be done at the two must popular location near San Pedro on Ambergris Caye, Namely the Hol Chan Marine Reserve and Mexican Rock. The World second largest barrier a mile offshore makes for some great snorkeling also. 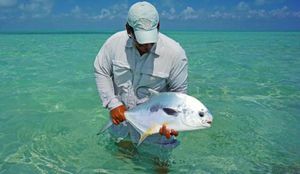 Green Horizon: Ambergris Caye Fishing Guides the flats in and around Ambergris Caye have been providing the excitement of fly fishing for bone-fish, permit and tarpon. The guide over at Green Horizon Fishing Flats cane arrange your Belize fishing trips and get you out on the water no matter if you are a novice or expert angler. San Pedro,Ambergris Caye, is a bustling town with several small and one large Western style supermarkets where you can buy pretty much anything. However, imported items can be very expensive,so if you enjoy American snack foods, pack them and take them with you. Fresh fruit and vegetables are readily available. There are several bakeries and butchers shops that sell all sorts of meats. All food on Ambergris Caye is inexpensive. Bring your appetite! The food is great and the service is even better! Eating "street food" or catching and cooking your own are part of the adventure that awaits. La Esquinita Deli The cheapest local eatery in town, great for backpackers and budget conscious. Belizean staple foods and some killer milkshakes for just $4 BZD, tasty $3 burritos. Filtered water provided there free of charge. At the corner of Buccaneer street and Pescador Dr.
Elvi's Go here first and you will return often! Papi's Diner "To Go the food delivery service in Ambergris Caye. Delicious, made to order dinner meals are their speciality. Great, local, inexpensive food. Try their Tropical Chicken or Crispy Chicken Burgers among the many other items available. For orders or more information, kindly call (626) 9207. Caramba's, in San Pedro, off of Pescador Street. The food is great, cheap, and plentiful. Estelle's. Breakfast by the sea. Waraguma is a hole in the wall on middle street (closer to the southern end) with good burritios. El Patio. Just around the corner from *Waraguma on the way to the beach. Good food and a great atmosphere. Sand floor and beach furniture. A varied menu with options for all. Not as expensive as the *Blue Water Grill . Blue Water Grill. Spectacular restaurant right on the beach. Fabulous food and drinks. If you want to treat yourself, this is the place. The water in San Pedro is safe to drink, but on the mainland and smaller islands, use bottled water to be safe. Many piers have bars where you might order a rum drink with a parasol in it. For a nice laid back bar on the beach try BC's. The Tacklebox makes a mean mojito. The local beer is Belikin, which can be bought everywhere. Hostel La Vista. Directly across from the main park and only 2 blocks from the water taxi arrivals area, backpacker's hostel offers private and dorm rooms with A/C and hot showers, free rum punch in the evenings, and tour bookings. Accepts credit cards. Dorms cost $15 US per person per night. SunBreeze Hotel. An oceanfront hotel located at the South Side of the heart of San Pedro. It has a freshwater pool, art gallery, massage studio, dive shop, bar and a restaurant (Blue Water Grill). They offer a great variety of packages for scuba diving and other activities. A great place for a family vacation in Belize. SunBreeze Suites. Is a cozy 20 suites hotel with entrance on the Main Street and bar & Grill on the beach side. It is located within walking distance from restaurants, bars, discos and minutes from the San Pedro Airport. They are affiliated with PADI Dive operator, so they can help you if you are looking for scuba diving in the cayes. Xanadu Hotel. By far the best pool on the island, and the owners treat you like family (a good thing in this case). Stay in any of the rooms in the hurricane proof huts, all have views of the ocean or the tropical garden pool. Easy walk to town, or take one of the complimentary bikes. The staff can arrange diving, snorkeling, or fishing trips. Conch Shell Hotel. A clean, quiet, friendly hotel. It's basic – no air conditioning or TV – but the ocean breezes blow right in, it's on the beach, and it cost only US$55 per night in offseason (it doubles in the high season). You'll be right in town so everything is nearby. Its convenienty located at the foot of the dock of the main water taxi between Ambergris Caye and Belize City. Las Terrazas Resort. Las Terrazas Belize Resort  is a luxury oceanfront resort on the island of Ambergris Caye. A member of the Preferred Hotel Group and located on 4.8 acres of private beachfront property, Las Terrazas is the perfect Belize vacation spot. Mata Chica Resort. A more intimate, relaxing atmosphere, on the northern part of the island. Accessible by boat from San Pedro, this small resort offers a limited number of thatched casitas right on the beach. This is a great place if you are looking to get away from it all for a few days. You can rent fully furnished and stocked homes by the week or more, for less than what it costs to get a hotel room for the same amount of time. "Sapphire Beach Resort". An Ambergris Caye resort, the Sapphire Beach Resort  is located along the beach near the Blue Hole, one of the most amazing dive sites in the world. Great for kayaking, snorkeling, and diving. Also includes diverse marine life, the barrier reef, and Mayan archaeological temples. Sunset Beach Resort Condos in Belize. 2.5 miles south of San Pedro Airstrip. Private, luxury beachfront apartment/condo complex with private pool made up of 3 buildings and 12 units (1, 2 and 3 bedrooms available). Rates start at $150 per night. https://www.SunsetBeachResortBelize.com Ideal for the couple, group of couples or small family seeking an affordable Belize vacation rental with top notch amenities. Complimentary bicycles, kayaks, beach toys and outdoor kitchen. Caye Caulker is another popular destination. Chetumal in Mexico can be accessed by a direct water taxi for $50 US / $100 BZD one-way. The boat takes 2 hours and will include customs clearance on both ends. You will also need $28 US for entry fees to Mexico and $40 BZD/$20 US for exit fees from Belize. These fees must be paid in cash, but you can use credit cards for the water taxi ticket. As of April 2016, this boat runs once per day, at 8:00 am, from the western terminal in San Pedro. If you want to buy tickets in advance, you must go to the eastern terminal (have your passport with you), where the boats from San Pedro & Caye Caulker arrive. This page was last edited on 27 July 2018, at 08:20.